Looking for a unique slider? Here's what you want, with Cute Slider you will be able to show your slides with awesome 3D & 2D transitions. PSD source files and a demo package with sample data are included to get you started. so you can setup your website like my website in few minutes, no extra hassle for manually setup. The framework is completely built with HTML5, CSS3, PHP 5.2+ and jQuery. so you are ready for future so why stay back dated? purchase this template and enjoy latest technology. Dianna's Unique Gift Baskets was established in 1995, with what had started out as a personal hobby grew into a full ti m e business. 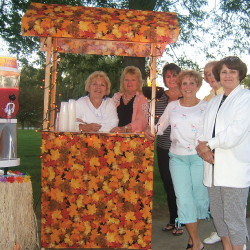 Dianna's offers many party services which include Custom Gift Baskets , Wedding / Party Decorating, and Frozen Drink Machine Rentals. Dianna's Unique Gift Baskets offers gift baskets for your friends, loved ones or even your employees. Each gift baskets are customized for each order. Contact us today to personalize your gift basket for whatever special occasion you may need. We welcome theme baskets as well as corporate orders. We use only the highest quality ingredients in each basket and each can be custom made to your specifications! Each individual basket we create is styled together with the utmost personal attention to your specific needs. We arrange and choose the contents of our baskets based on what you, our most valued customer, require. From baby baskets to Kosher baskets, our gift baskets make excellent gifts for any reason. Our Pastry & Cookie Thank You baskets are amongst the most popular choices. We offer delivery service to homes and businesses. Dianna's Unique Gift Baskets also can assist you with your party decorations! We offer custom invitations, table centerpieces, napkins, lighted pillars, lighted arches, chair coverings, ribbons, matches, party favors & so much more! Let our elegant party decorations enhance your wedding reception's beauty. From church to reception, we can take care of all your decorating needs. Don't forget your wedding party's gifts! We can custom design baskets for the groomsmen to the flower girl. 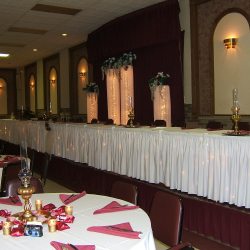 Call us today to see how we can create an elegant setting without breaking your budget. Want to add a little fun to your party? Why not try one of our Frozen Drink Machine Rentals? Great for adult parties, graduations, barbeques, birthdays, holidays, and even weddings. You can make Margarita's, Daiquiris or even plain Slushies. We will even dress the machine for the occasion for no additional charge! How fun is that! Dianna Caldwell started making gift baskets from her home many years ago as presents for her friends and family. One thing let to another, Dianna was getting requests for gift baskets that her friends and family could give out as gifts! The passion was lit. Dianna was never one to do anything on a "part time" basis. She jumped in will full ambition and her full time gift basket business was born. A large portion of Dianna's business are corporate gift baskets accounts. She also specializes in baskets for doctors offices, real estate brokers, funeral / bereavement, baby baskets, and many other professionals. Dianna always welcomes new business and looks forward to creative theme basket requests!